It's been the day from hell. We ran out of hay after this morning's feeding. 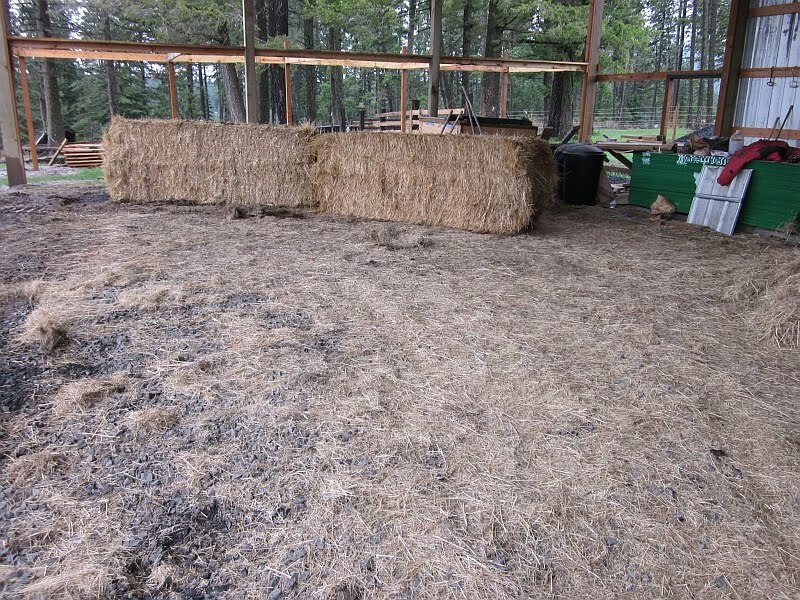 Remember all that hay we put up last summer? It's gone. This isn't unexpected, actually. Last year we were buying hay by March, so the fact that we were able to make it through most of April this year isn't bad. We knew we knew we were running low on hay, but we also faced a Catch-22: the farmer who had the best price for hay wouldn't sell on days when it was sunny, because he was working on sunny days (makes sense, can't blame him), so we had to wait for a rainy day. This is all we have left in the barn. 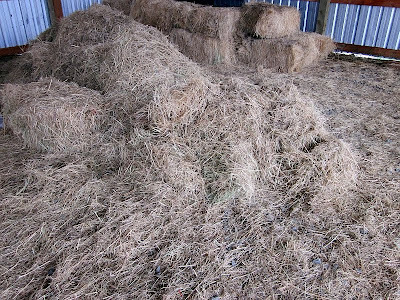 The bales you see are bales of wind grass (also called cheat grass), an invasive species the cows won't touch. It's nutritionally useless and (apparently) bad-tasting. 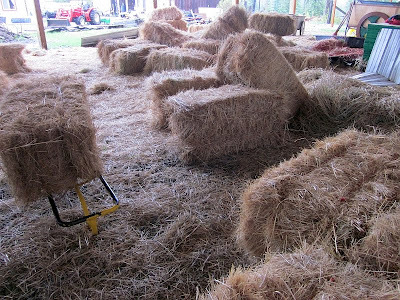 When the farmer baled our neighbor's land last year, he baled what was there... including some wind grass (it's not like you can pick and choose what to bale, after all). 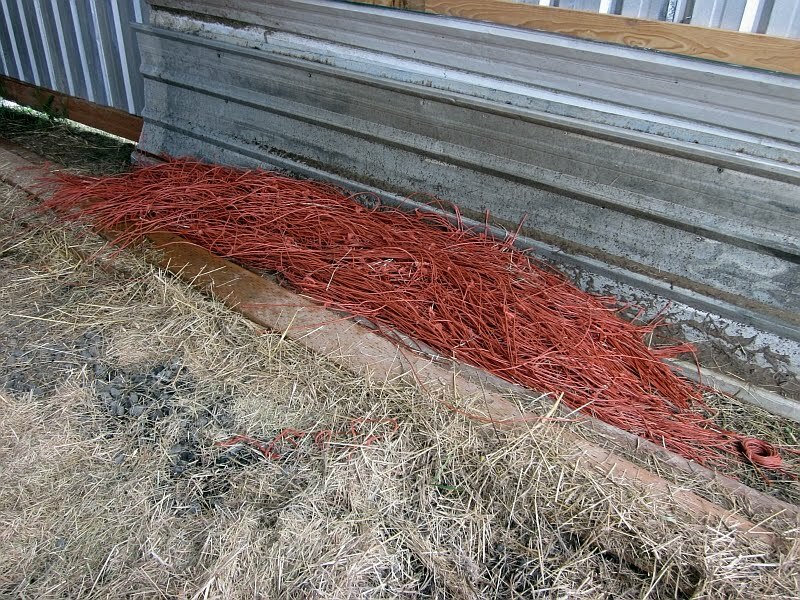 So -- since we can't use this for food, we'll save it for bedding. Today was rainy. Rainy, cold, and nasty. (So much for our 80F days!) It was a day to get hay. ...and got as far as a turnoff from the highway about twenty minutes from home when the truck overheated. Dangerously so. Crud. 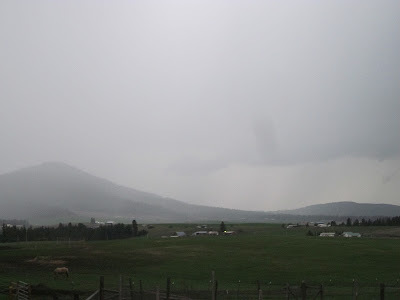 There we sat on the side of the road, listening to the rain pounding down on the truck roof, waiting for the temperature to regulate to we could make it into the nearest town (about ten miles away). We limped into town, keeping an eagle eye on the engine temperature, and parked in an awkward spot (remember, we had a trailer) while Don added coolant and we waited for the engine to cool. Is it the thermostat or is it the water pump? Hopefully the problem is the former and not the latter, since a water pump costs a fortune to replace (and must be done by a mechanic), whereas a new thermostat costs about $9 and Don can replace that himself. Anyway, our appointed time to meet the farmer came and went, so we called and explained our situation and said we'd try again later to get hay. When the truck's temperature went down, we turned around and drove home verrrrry carefully, watching the gauge the whole time. Once we reached home, Don called another neighbor and offered to pay him if he could pick up some hay for us. But this neighbor (who works for the highway department) had been fighting the weather all day, was just getting off work, and was exhausted. 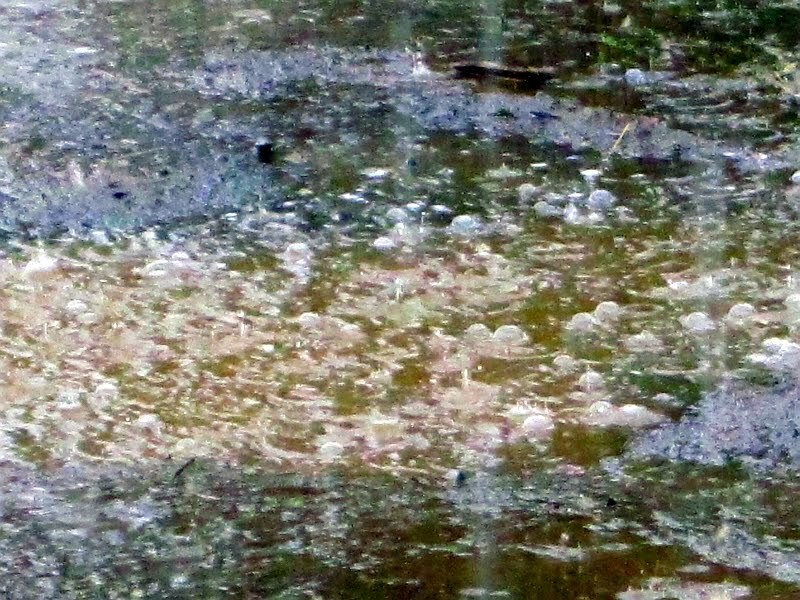 Meanwhile the rain was pelting down so hard it was making bubbles in the puddles. So off Don went with the borrowed vehicles. While he was gone, I marshaled the girls to help me straighten up the barn. 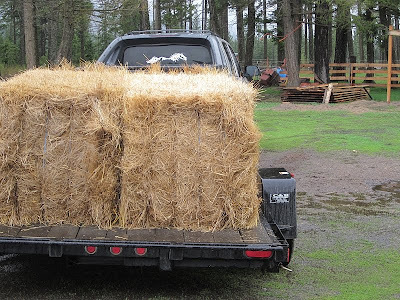 So while the rain poured and the wind blew, we waited for Don to return with hay. Meanwhile we now had a wide place to put it. ...and use a (borrowed) tractor to drag them off the trailer. ...then scooted the tractor around so I could chain it up for him to pull in. We repeated this procedure with the second bale. 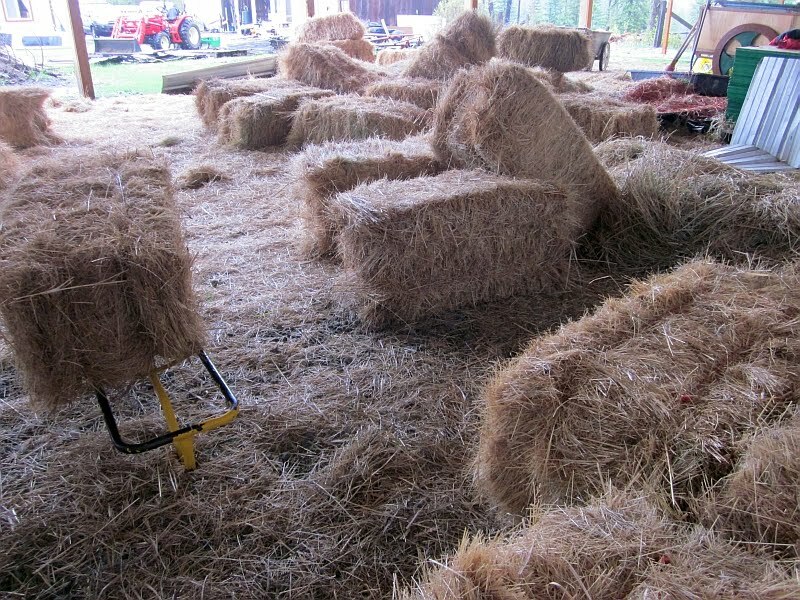 It was a whole lotta work for two flippin' bales of hay. And the frustrating thing is, we bought another 15 bales we somehow have to get from there to here. Groan. Borrow borrow borrow. It seems that's all we did all day long. A process that should have taken two hours ended up taking seven hours and necessitated the use of other peoples’ possessions. And a whole day was shot. With small bales, we can move them around ourselves. 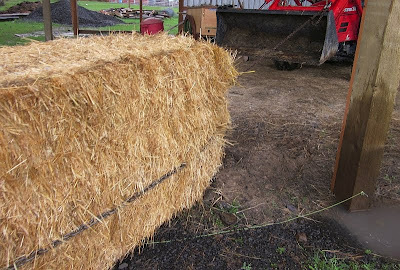 But most farmers understandably prefer to bale in large bales, which means using equipment to move them around, equipment we don’t own and can’t afford. Meanwhile our internet service (which is normally fairly speedy) was running so slow this evening that each photo in this blog post took about ten or fifteen minutes to load. A blog post that should have taken about ten minutes to put up ended up taking ninety. Sorry to gripe, it's just been one of those days, a day filled with petty annoyances and major inconveniences and lots of hassle. One of those days when we just want to collapse with a glass of wine in the evening and be thankful we have so many lovely and generous friends who entrust us with their vehicles and equipment. Haven’t we all had days like this? Okay, I’ll feel better tomorrow, honest. Country living. Not always what it's cracked up to be. Sounds like you both deserve a glass of wine and some time in a hot tub! Thank goodness, though, you do live in the country where neighbors will loan you equipment and pitch in when they can. I'm sorry you all had such a rough day! But I'm glad you have good neighbors who tried to help out, and I'm also glad you shared the "downside" with those of us who are trying to get to where you are. Grass always looks greener and so forth. It's always better to know the things that could potentially happen, and how to handle 'em. Hoping tomorrow is a wonderful day for you! Had to chuckle a bit, sorry Some days you just want to sit all day a eat chocolate! Living on a farm looks so fun until I see your posts like this one, it ain't for sissy's thats for sure!! Hope you have a better day today!! So sorry you had such a rough day. Thankfully I find most days are not like this and so it makes the ones like this not seem as bad in the big scheme of things. Pray that it's a simple fix for you truck and that Don can do the work. Patrice, OMG, when it rains it pours! Sorry to hear you had one of those days. Thank God for great neighbors. Now I hope you sat back last night and enjoyed that glass of wine and laughed the day off. I don't have a glass of wine in my hand, but I do have a cup of hot tea. So, I am sending you a Friday cheer. 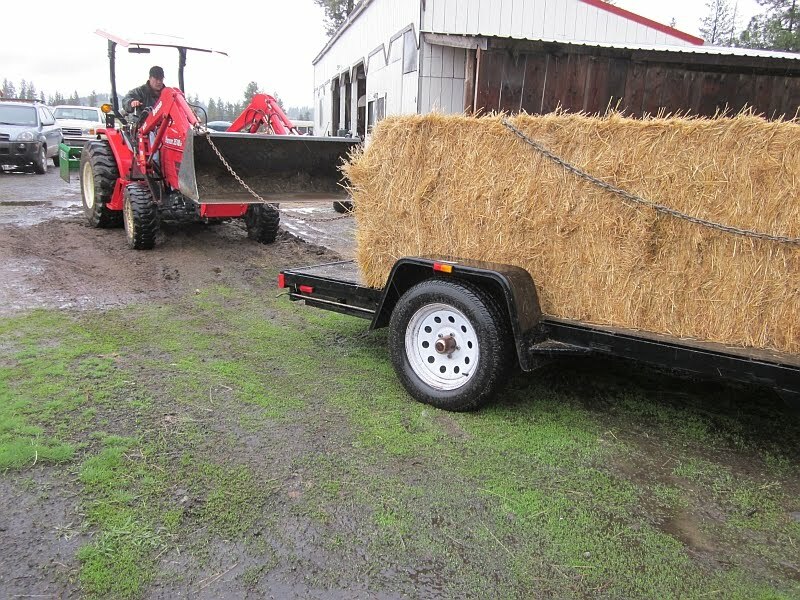 Here's hoping for a better weekend, fixed truck and plent of hay to feed the animals. Salute!!!! 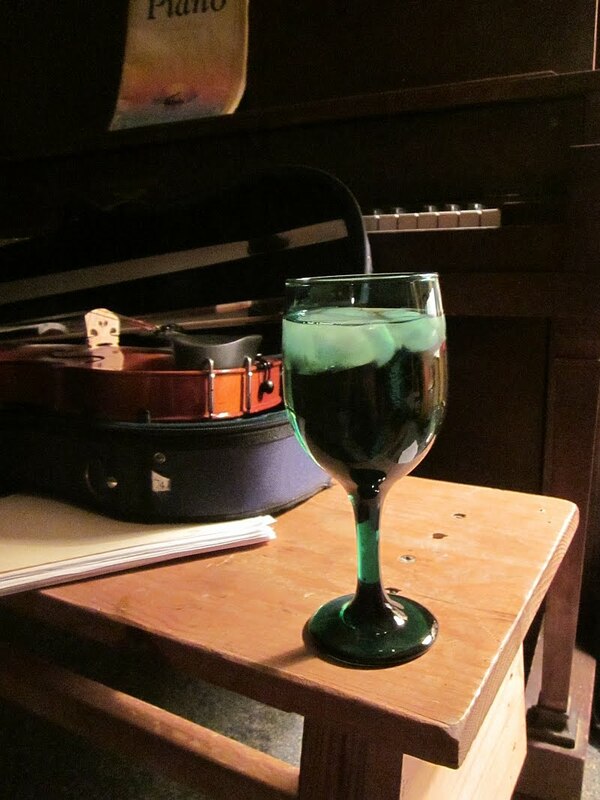 Is that ICE I see in your wine?????? A few years ago I had a company truck that constantly ran HOT. Checked the thermostat - OK. Not the water pump because it wasn't leaking out of the weep hole in the pump. Checked the antifreeze level - WAYYY to high, 90%. Antifreeze has no heat transfer capability and the percentage shouldn't be above 50%. Just a thought. If your Ford tractor has a 3 point hitch you should be able to buy or have made a set of hay forks that will attach to it. 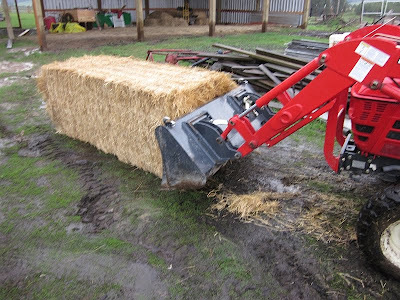 I have seen them but have never used one so cannot say if they would work on the big square bales or not. 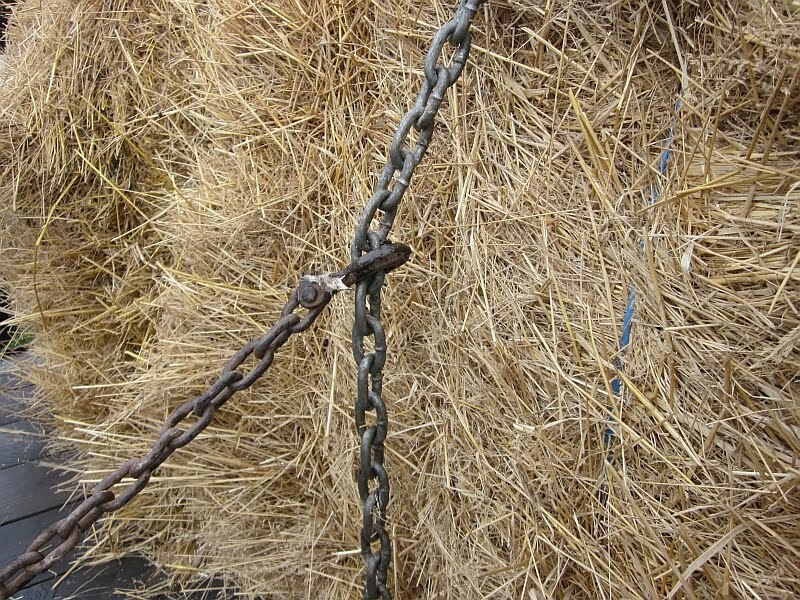 I have seen them used on round bales however. Something to think about. 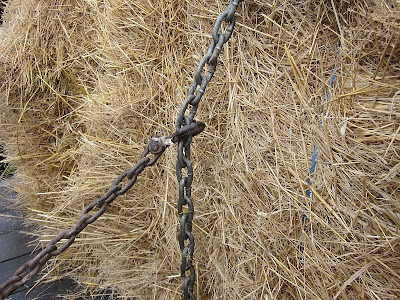 Back the trailer into the shed then chain the bails to the back wall posts. Then drive the trailer out from under the bails. 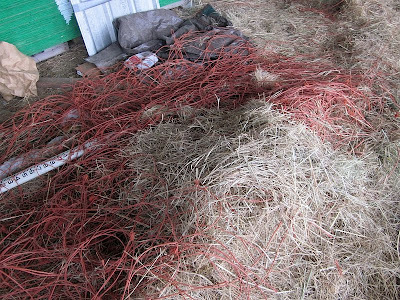 Until we get our small barn, we have no place to store hay, so we un-bale it into feed, grass seed and plastic bags. We have a tiny shed out by the coop that will hold three bags. The rest of the bags are loaded into the pick-up. When we have to use the truck, we gotta unload all those bags! 3 demerits for me, too - can't drink wine without ice! At least you only had 1 day like that. Remember the era of many days like that? I do! Ugh! Im living this today as well Patrice... Though it is really no consolation. One of our 3 calves died over night from sudden scours, and the other 2 aren't fairing well. Besides work, and other obligations during the day I am very thankful my parents were near by for my catastrophic meltdown over cow poo. *SIGH* Its cold here again, and well... just a bad bad day here too. :-/ Hard work, little pay, and even less sleep. Take the good with the bad I suppose. you have wonderful neighbors! here in n.e. mississippi it is difficult to find the small hay bales too...most that can be gotten are those huge rounds of hay...and those can be expensive during really dry spells. 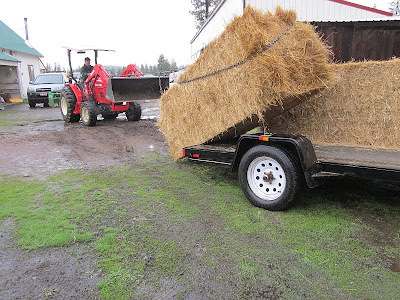 used to be all hay came in smaller easier handling bales...we used to get paid a nickel a bale for loading fresh baled hay onto trucks and into barns when we were kids and needed to earn county fair money. sometimes progress is not what it is cracked up to be..sometimes, the old ways of doing things make more sense. I feel for you. Thank the good Lord that out of 365 days a year there really aren't TOO many like this! A bad day in the country still beats a good day in the city! Hi, Patrice, As a founding member of the club I would like to offer some of the extra t-shirts, bumperstickers, and coffee cups. We have had motors throw rods hauling hay, not to mention over heating and a broken distributor shaft. The real challange was the trip to get a cow and calf that turned into the pitstop from Hell. We replaced a water pump in a convience store parking lot 200 miles from home.We truely relied on the kindness of strangers. 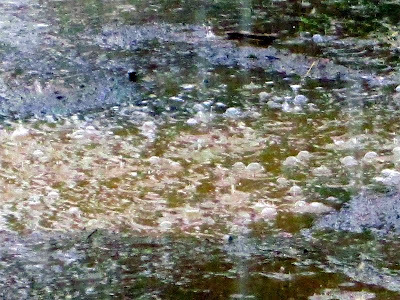 I guess the sayin', "When it rains, it pours..." ??? Love your interesting blog. Both hubby and myself read and enjoy. Have learned alot, too. Thank You. Ah yes, hay. 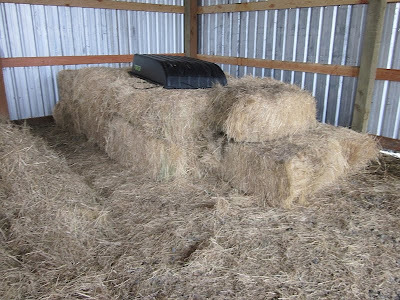 We are down to three bales, but thankfully our pasture is lush and we have another 200 bales ordered. Usually our disasters involve the goats getting out... at the most inopportune times! After we got our goats I heard a saying about goat fencing... "If it won't hold water, it won't hold a goat!" It is very nearly true! The rough days make you appreciate the good days, besides, bad day plus time equals good story sometime in the future! 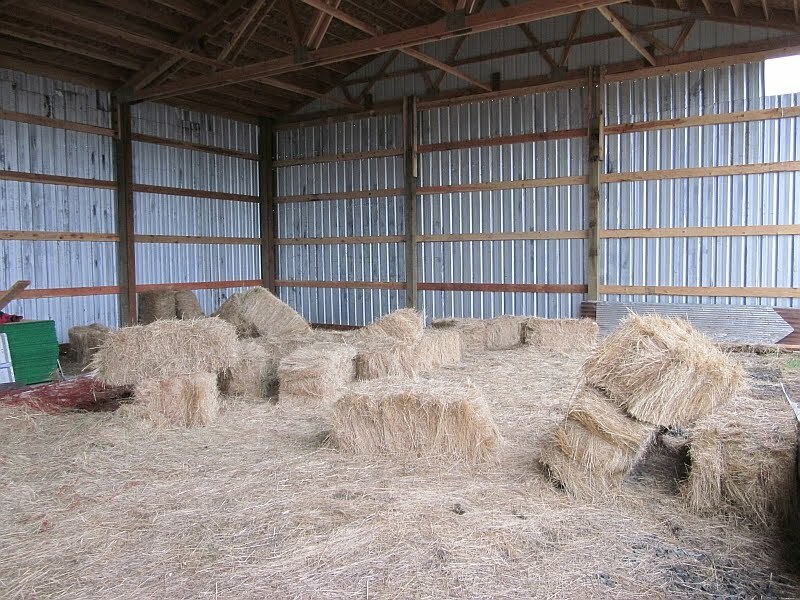 We ran out of hay as well just recently. We've put all the animals out on pasture though and they seem to be doing great. Our cow began giving record amounts of milk the first day! A block and tackle maybe? Come-along? Truck winch? 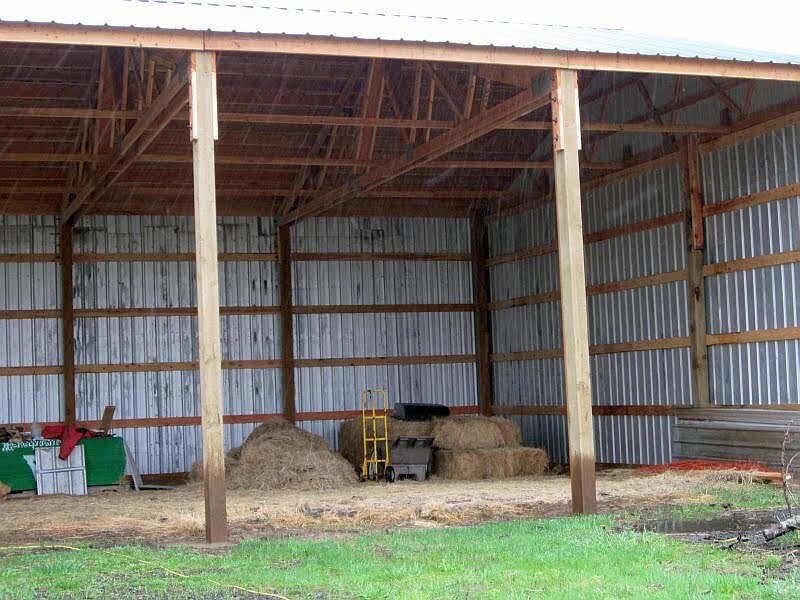 You can just use a real long rope/chain and a solid sunk post or two to angle it around obstructions. We've used truck winches and other trucks as posts to move heavy equipment before. The trucks were armored vehicles that weighed several thousands of pounds so while I wouldn't normally suggest vehicles as posts it did work. Good luck.